A well-rated hotel in the area among our guests for in-room amenities a convenient location free breakfast and an outdoor pool the Super 8 Orangeburg Near I-26 also offers low rates. This two-story pet-friendly hotel has 55 rooms some of which are designated non-smoking. Each room features a microwave mini-fridge hair dryer iron/ironing board coffeemaker in-room safe and cable TV with premium channels. The hotel serves a free continental breakfas. 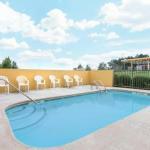 There is a small seasonal outdoor pool and a business center for guests' convenience. High-speed internet access is available. Located near the exit from I-26 the hotel is 35 miles southeast of Columbia and 75 miles northwest of Charleston. South Carolina State University is four miles away. Santee Cooper Lakes are 18 miles away and Lake Marion is 23 miles. Columbia Metropolitan Airport is 32 miles from the hotel.